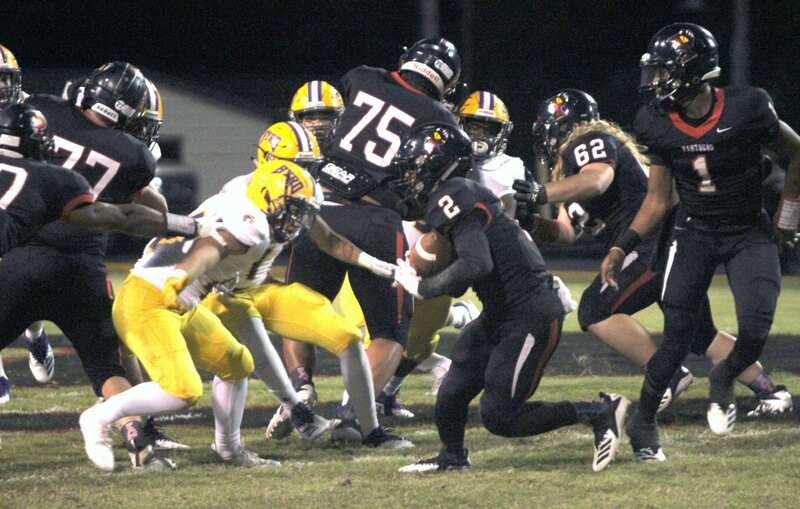 The Parkway Panthers fell to the Byrd Yellow Jackets 31-13 in a District 1-5A game Thursday night at Bobby Marlow Field at Preston Crownover Stadium. Parkway dropped to 3-3 overall and 1-3 in district. Byrd improved to 5-1 and 3-1. For the second straight week, Parkway played well on defense in the second half, limiting the Yellow Jackets’ option offense to one touchdown. But Byrd scored 24 points in the first half and the Panthers failed to capitalize on a couple of scoring opportunities in the third quarter. Trailing 24-13, Parkway opened the second half with an onside kick and the Panthers’ Kaybien Smallwood recovered it at the Byrd 44. Alijah Barnett carried three times for 20 yards and Parkway drove to a first down at the 21. On second-and-12, sophomore quarterback Gabriel Larry completed an 8-yard pass to Kentravious Morris. But on third down, Larry fumbled at the 10 and the Yellow Jackets recovered. Four plays later, Byrd returned the favor. Parkway’s Adam Johnson recovered the fumble at Byrd 22. The Panthers were called for holding on second down, moving the ball back to the 29. After Morris gained 8 yards to the 21, Morris fired a pass to Larry and the Jackets were flagged for pass interference, giving Parkway a first down at the 10. A penalty against Byrd on second down moved the ball to the 5, but Morris was tackled for a 2-yard loss. Two incompletions followed and the Jackets took over. In the fourth quarter, the Panthers lost a fumble at the their 28. The Jackets capitalized with their final touchdown with 6:02 left. Behind the running of Charlie Barham, Byrd took an early 14-0 lead. Parkway cut the lead in half on a 72-yard option pass from Morris to Peyton Lewis. After Byrd went up 21-7 in the second quarter, Parkway answered with a 1-yard pass TD pass from Larry to Morris. The pass capped an 85-yard drive. Barnett had a 17-yard run, and Morris a 17-yard reception. Larry also hit Barnett with an 18-yard pass on first down from the Byrd 23. The PAT was blocked and Parkway trailed 21-13 with just 21 seconds left in the half. But Byrd completed a 41-yard pass and a facemask penalty moved the ball to the 16. On the final play of the half, Scotty Roblow booted a 33-yard field goal. Click here to read the rest of the Bossier Press-Tribune article.